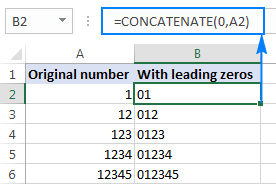 This tutorial shows different ways to add leading zeros in Excel: how to keep zeros as you type, show leading zeros in cells, remove or hide zeros. If you use Excel not only to calculate numbers, but also maintain records such as zip codes, security numbers or employee ids, you may need to keep leading zeros in cells. However if you try typing a zip code like "00123" in a cell, Excel will immediately truncate it to "123". The point is that Microsoft Excel treats postal codes, phone numbers and other similar entries as numbers, applies the General or Number format to them, and automatically removes preceding zeroes. Luckily, Excel also provides the means to keep leading zeros in cells, and further on in this tutorial you will find a handful of ways to do it. Select the cell(s) where you want to prefix numbers with 0. Go to the Home tab > Number group, and select Text in the Number Format box. 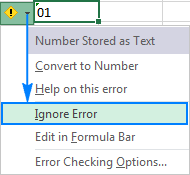 As soon as you type a zero(s) before number, Excel will display a small green triangle in the top-left corner of the cell indicating that something is wrong with the cell contents. To remove that error indicator, select the cell(s), click the warning sign, and then click Ignore Error. Another way to keep leading zeros in Excel is to prefix a number with an apostrophe ('). For example, instead of typing 01, type '01. In this case, you don't need to change the cell's format. Bottom line: This simple technique has a significant limitation - the resulting value is a text string, not number, and consequently it cannot be used in calculations and numeric formulas. If that is not what you want, then change only the visual representation of the value by applying a custom number format as demonstrated in the next example. 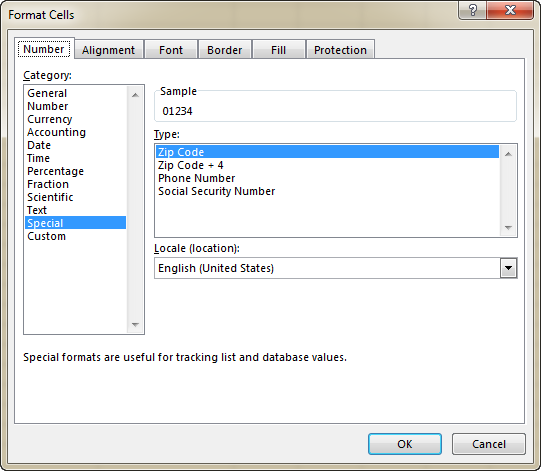 Select a cell(s) where you want to show leading zeros, and press Ctrl+1 to open the Format Cells dialog. Type a format code in the Type box. In most cases, you will need a format code consisting of 0 placeholders, like 00. The number of zeros in the format code corresponds to the total number of digits you want to show in a cell (you will find a few examples below). 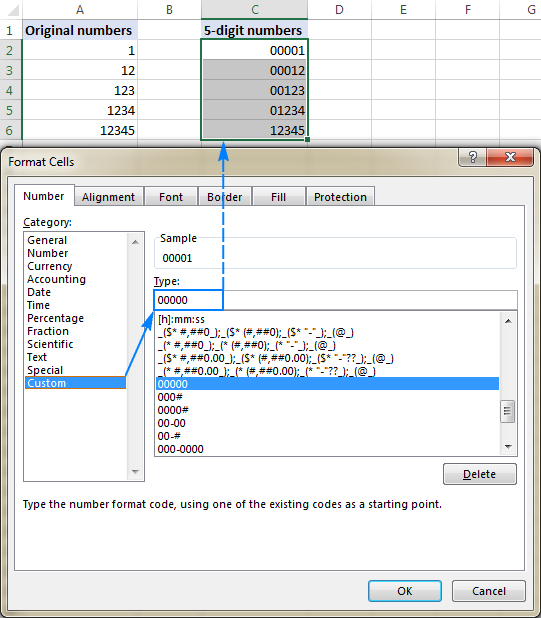 For example, if you apply the 000# format to some cell, any number you type in that cell will have up to 3 leading zeros. Your custom number formats can also include spaces, hyphens, parentheses, etc. The detailed explanation can be found here: Custom Excel number format. The following spreadsheet gives a few more examples of custom formats that can show leading zeros in Excel. And the following format codes can be used to display numbers in special formats such us zip codes, phone numbers, credit card numbers, and social security numbers. Bottom line: This method is best to be used in situations when you work with a numeric dataset and the results should be numbers, not text. It changes only the display of a number, but not the number itself: leading zeros show up in cells, the actual value displays in the formula bar. When you reference such cells in formulas, the calculations are perfumed with the original values. Custom formats can only be applied to numeric data (numbers and dates) and the result is also a number or date. 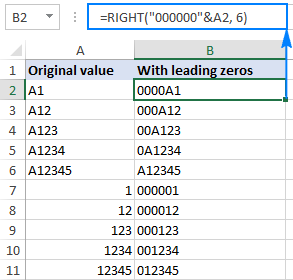 While a custom number format shows zero in front of a number without actually changing the underlying value, the Excel TEXT function pads numbers with zeros by "physically" inserting leading zeros in cells. To add leading zeros with a TEXT(value, format_text) formula, you use the same format codes as in custom number formats. However, the result of the TEXT function is always a text string, even if it looks much like a number. 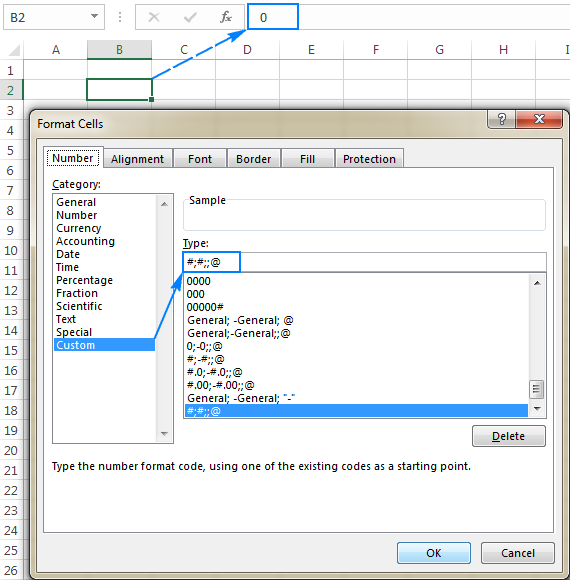 For more information about Text formulas, please see How to use the TEXT function in Excel. Bottom line: The Excel TEXT function always returns a text string, not number, and therefore you won't be able to use the results in arithmetic calculations and other formulas, unless you need to compare the output with other text strings. In the previous examples, you learned how to add zero before a number in Excel. But what if you need to put zero(s) in front of a text string like 0A102? In that case, neither TEXT nor custom format will work because they deal with numeric values only. If the value to be padded with zero contains letters or other text characters, use one of the following formulas, which offer a universal solution applicable to both numbers and text strings. "0000" is the maximum number of zeros you want to add. For example, to add 2 zeros, you type "00". Cell is a reference to the cell containing the original value. String_length is how many characters the resulting string should contain. In the above example, the maximum number of zeros equals the total string length (6 characters), and therefore all of the resulting strings are 6-character long (fixed length). If applied to a blank cell, the formula would return a string consisting of 6 zeros. LEN(A2) gets the total number of characters in cell A2. REPT(0, 6-LEN(A2)) adds the required number of zeros. To calculate how many zeros should be added, you subtract the length of the string in A2 from the maximum number of zeros. Bottom line: This formula can add leading zeros both to numbers and text strings, but the result is always text, not number. To prefix all values in a column (numbers or text strings) with a certain number of zeros, use either the CONCATENATE function or the ampersand operator. In the same manner, you can insert 2 leading zeros (00), 3 zeros (000) or as many zeros as you want before numbers and text strings. Bottom line: The result of this formula is also a text string even when you are concatenating zeros with numbers. If preceding zeroes were added with a custom number format (zeros are visible in a cell, but not in the formula bar), apply another custom format or revert back General as shown here. 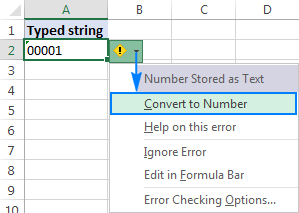 If zeros were typed or otherwise entered in cells formatted as Text (a small green triangle is displayed in the top-left corner of the cell), convert text to number. 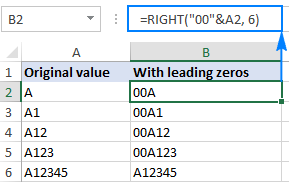 If leading zeroes were added by using a formula (the formula appears in the formula bar when the cell is selected), use the VALUE function to remove them. 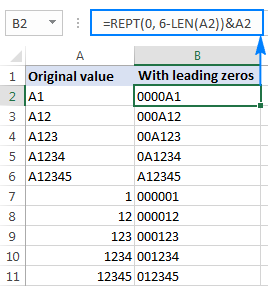 If leading zeroes are shown in cells with a custom format, then change the cell format back to default General, or apply another number format that does not display preceding zeros. Where A2 is the cell from which you want to remove preceding zeros. This method can also be used to get rid of zeros typed directly in cells (like in the previous example) or imported to Excel from some external source. Overall, if you are dealing with a zero-prefixed string that represents a number, you can use the VALUE function to convert text to number and remove leading zeros along the way. The Value formula in C2 removes the leading zeros from the value in B2. For this, select the cells where you want to hide zeros, click Ctrl+1 to open the Format Cells dialog, select Custom under Category, and type the above format code in the Type box. 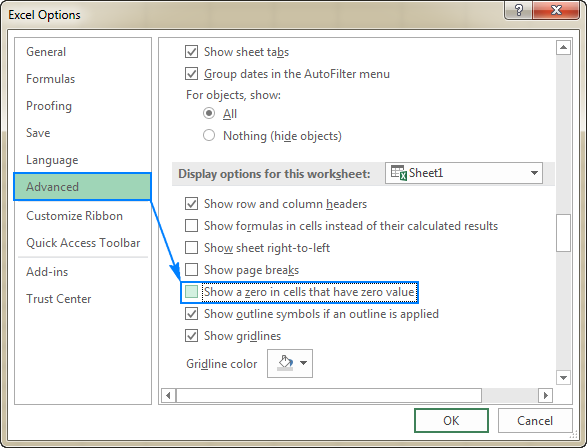 This is how you can add, remove and hide zeros in Excel. To better understand the techniques described in this tutorial, you are welcome to download the sample Excel Leading Zeros Workbook. I thank you for reading and hope to see you on our blog next week. 31 Responses to "How to add leading zeros in Excel"
Lots of thanks. Keep on. Please, is there a way one can retain the zeros in front of mobile numbers after the cell has been formatted and the mobile numbers copied and pasted instead of entering them one after the other? I'm trying to convert them to VCard Files but the numbers copied and pasted do not have the zeros in front of them after conversion unlike the ones that were entered individually. I will greatly appreciate your prompt response. i want to calculate how many zero in one cell can anyone help me in that for example i write 5000 in one cell in 5000 there is 3 zero in that figure. I want 5.25 to be 0-052 is this possible? Hi I have subtracts some number and generate a series and wants a suffix in this series. Can you initially enter the number as .095 then format it as a percentage? Right now, it's entered as 95 and then formatted as a percentage. When entering 17 digits of RSBY, it shows last two digit as 00. Please guide for converting it to its original number. Eg: 32245614656464567, it shows 32245614656464500. Please guide me to correct this option. Instructions are clear and detailed and with plenty of illustrations. Great job, Svetlana! I want to add zero and space e,g (078 444 7777). But every time i add number it show like this (0784447777). I really need some help, i have time stamps (6:25) which is minutes and seconds but i need it to show the hour without having to manually ad the 0: in the front (0:06:25) How can i make 6:25 to show 0:06:25. I have a Number R00835 instead I need R0835.How to supress one zero.